Hand crafted polished wood curtain pole in light oak finish (as shown) or a medium oak finish, complete with solid brass rings, finials and brackets. Supplied with 10 rings per metre pole. 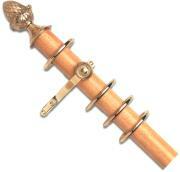 Curtain poles of 2.44m and above have a centre bracket included. Bracket projection 29mm.